This article is about the solar Ottoman calendar based on the Julian calendar. For the lunar Hijri calendar, see Islamic calendar. The Rumi calendar (Turkish: Rumi takvim, "Roman calendar"), a specific calendar based on the Julian calendar was officially used by the Ottoman Empire after Tanzimat (1839) and by its successor, the Republic of Turkey until 1926. It was adopted for civic matters and is a solar based calendar, assigning a date to each solar day. The Hebrew date 22 Nisan 5671 (22 ניסן 5671) appears at the bottom. In the Islamic state of the Ottoman Empire, the religious Islamic calendar was in use, within which days are numbered within each lunar phase cycle. Because the length of the lunar month is not an even fraction of the length of the tropical year, a purely lunar calendar quickly drifts relative to the seasons. In 1677, Head Treasurer (Turkish: Baş Defterdar) Hasan Pasha under Sultan Mehmed IV proposed the correction of financial records by dropping one year (an escape year) every 33 years, resulting from the difference between the lunar Islamic calendar and the solar Julian calendar. In 1740 (1152 AH) during the reign of Sultan Mahmud I, March was adopted as the first month of the fiscal year for the payment of taxes and dealings with government officials instead of Muharram following Treasurer Atıf Efendi's proposal. Proposed by Treasurer Moralı Osman Efendi during the reign of Sultan Abdul Hamid I, the range of the fiscal calendar applications was extended in 1794 to state expenditures and payments in order to prevent surplus cost arising from the time difference between the Islamic and Julian calendar. The Julian calendar, used from 1677 AD on for fiscal matters only, was adopted on March 13, 1840 AD (March 1, 1256 AH), in the frame of Tanzimat reforms shortly after the accession to the throne of Sultan Abdülmecid I, as the official calendar for all civic matters and named "Rumi calendar" (literally Roman calendar). The counting of years began with the year 622 AD, when Muhammad and his followers emigrated from Mecca to Medina, the same event marking the start of the Islamic calendar. The months and days of the Julian calendar were used, the year starting in March. However, in 1256 AH the difference between the Hijri and the Gregorian calendars amounted to 584 years. With the change from lunar calendar to solar calendar, the difference between the Rumi calendar and the Julian or Gregorian calendar remained a constant 584 years. Since the Julian to Gregorian calendar changeover was finally being adopted in neighboring countries, the Rumi calendar was realigned to the Gregorian calendar in February 1917, leaving the difference of 584 years unchanged, however. Thus, after February 15, 1332 AH (February 1917 AD), the next day instead of being February 16 suddenly became March 1, 1333 AH (March 1, 1917 AD). The year 1333 AH (1917 AD) was made into a year with only ten months, running from March 1 to December 31. January 1, AD 1918 thus became January 1, AH 1334. The Rumi calendar remained in use after the dissolution of the Ottoman Empire into the first years of the succeeding Republic of Turkey. The use of the AH era was abandoned as part of Atatürk's reforms by an act of December 26, 1341 AH (1925 AD) and was replaced by the common era from 1926. 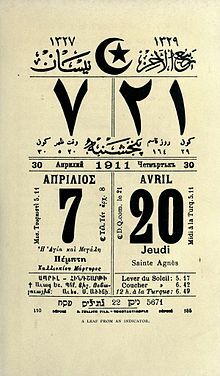 The names of four months that occur in pairs in the Semitic/Arabic naming system (Teşrin-i Evvel, Teşrin-i Sânî and Kânûn-ı Evvel, Kânûn-ı Sânî) were changed on January 10, 1945 to Turkish language names, Ekim, Kasım, Aralık and Ocak, for simplicity. From 1918 the fiscal year has commenced on 1 January. In the Ottoman Empire, the lunar-based Hijri calendar remained in use for religious matters alongside the Rumi calendar. In order to prevent confusion between the dates, both calendars were used on most documents. Until the end of 1332 AH, Rumi dates in the last 12 or 13 days of December, all of January, and February belong to the following Gregorian year. Until the end of February 1917 AD, Gregorian dates in January, February, and the first 12 or 13 days of March belong to the previous Rumi year. No conversion is possible, since the Rumi calendar was not in use. Add 12 days and 584 years to find the Gregorian date. Add 13 days and 584 years to find Gregorian date. ^ a b c d "Takvimler ve Birbirlerine Dönüşümleri – Rumi Takvim". Takvim.com (in Turkish). Retrieved 2008-06-14. ^ "History of the Ottoman Empire – The Ottoman Empire 1839–1861". World History at KMLA. Retrieved 2008-06-14. ^ Revue du monde musulman 43 (1921) p. 47. ^ A. Birken, Handbook of Turkish Philately Part I – Ottoman Empire: The Calendar (Nicosia, 1995) 11. ^ Georgeon, François (Spring 2011). "Changes of time: An aspect of Ottoman modernization". New Perspectives on Turkey 44. Retrieved 2013-01-06. This page was last edited on 29 June 2018, at 15:55 (UTC).